← Our Platt Springs Road Location is Closing! 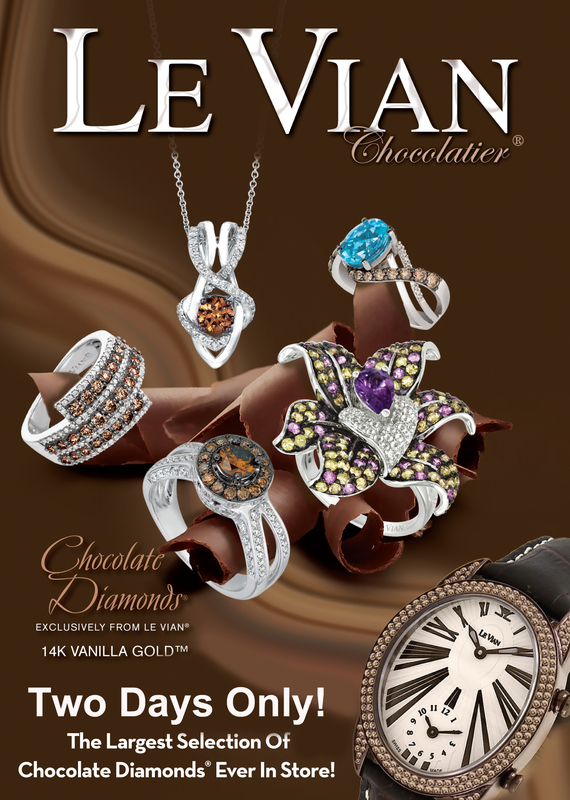 Preview the largest collection of Chocolate Diamonds exclusively by Le Vian, at the special Le Vian trunk show event, which we will have at our Harbison location starting today. It will also be located at our Northeast location tomorrow. Wrap yourself in delicious Le Vian all season, every season and don’t miss the opportunity to find the delectable treat you will treasure forever. This spectacular show will feature all the Le Vian brands you love including: Le Vian Chocolatier, Le Vian Couture, Le Vian, Le Vian Exotics, and the Le Vian Time, as well as a selection of the top trend forecasted items for 2013. Glimpse at a selection of Le Vian Red Carpet designs, worn by some of the hottest celebrities. Getting engaged in 2013 or desire to refresh your wedding set? Don’t miss the debut showings of Le Vian Bridal featuring Chocolate Weddings – uniquely multifaceted designs for the fashionista bride today. Today, April 9th, it’s located at the Harbison store until 9 pm. From 7- 9 pm it’s appointment only. Tomorrow it’s at our Northeast location from 10-9. From 7-9 pm it’s by appointment only. $500 trade up for an item $500 – $2500; $1000 trade up for an item $2500 and up. You must have a a registered certificate entitled to a lifetime trade up on your Le Vian brand jewelry item. Stop by for this event at our Harbison or Northeast locations for a showing of the latest Le Vian trendsetting designs! This entry was posted in Celebrity Jewelry, Diamonds, Jewelry, Jewelry History, Jewelry News, Jewelry Tips and tagged chocolate diamonds, diamonds, jewelry warehouse, levian, levian jewelry, levian trunk show. Bookmark the permalink.